Cobblers V Wycombe Wanderers. 'Arron Davies. WALES ace Arron Davies is hoping a good season at Sixfields will aid his chances of playing for his country again. The 27-year-old has one international cap to his name after coming off the bench against Trinidad & Tobago in 2006, when he was playing his club football for Gary Johnson’s Yeovil Town. 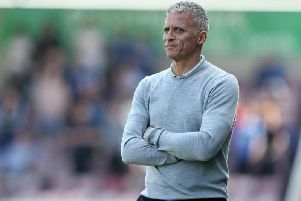 But he still feels he has time to add to his tally and knows a good season with the Cobblers could catapult him into the thoughts of Wales boss Gary Speed. Davies certainly has pedigree as he has played a number of games for the under-21 side and even captained a team containing Tottenham star Gareth Bale. And now, after securing a summer switch to Town from Peterborough, the playmaker is eyeing a Champagne campaign which could help him earn further international recognition. Davies cites the example of former Blackpool man David Vaughan as one to follow as he aims to hit the top and believes it’s all about mental strength, a quality he’s sure he possesses. “That (the Wales appearance) was an amazing experience,” said the Cobblers new boy. “I was with the (under) 21s, captained the 21s and went into the full team and I stayed there quite a bit. “(Manager at the time) John Toshack showed quite a lot of faith in me, even when I was injured he was still naming me in his squads. “There’s a new manager now (Gary Speed) and it does seem a long way off but you have to look at the players at Blackpool who were playing in league two for different teams and now they’re established Premier League players like David Vaughan. The Cobblers faithful have seen glimpses of the ability Davies has at his disposal during pre-season and he’ll now be aiming to set npower League Two alight when it kicks off on Saturday. Along with last season’s player of the year Michael Jacobs, Jake Robinson and Adebayo Akinfenwa, the former Nottingham Forest ace will provide a potent attacking threat. And Davies has told the Town fans he is aiming to bring plenty of ammunition to the party so that his new team-mates can fire the club to promotion this season. He said: “I’m a busy player, like to get on the ball, make things happen. I like to get shots off and just keep things moving. “My thing in the team is the link man between midfield and attack and I’ll look to get Jakey (Robinson) and Bayo (Akinfenwa) and Shauny (Harrad), when he’s fit, some goals and get some goals myself.